Hunstanton Searles Seatours run unique and exciting seal safaris and coastal trips, aboard two famous amphibious vessels, The Wash Monsters. 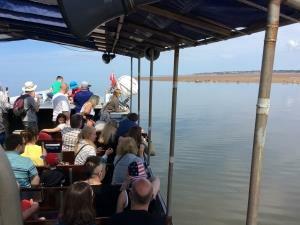 Departing from the central promenade in Hunstanton, each tour provides a truly fascinating and fun way of discovering the local seal population, coastal areas with panoramic views as well as learning of local history and fascinating legends around The Wash. It is advisable to telephone between 9am - 10am for weather updates and availability to avoid disappointment. Adult 14 yrs +: £18.00. Children under 14 yrs: £10.00. Follow signs for South Beach and car parks on arrival at Hunstanton. Parking available on seafront car parks. All trips leave from Southern Promenade (in front of the Sealife Aquarium).